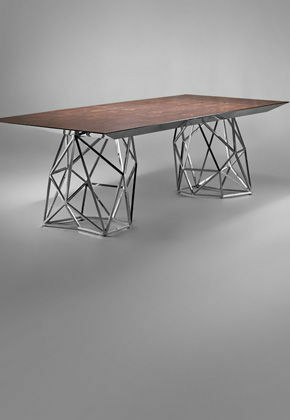 Designs based on profiles of steel or aluminum combine solidity and elegance. 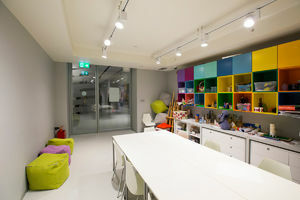 The materials used are wood, MDF, particleboard, plastics and glass in various combinations. Available are eco-style options and economy-class systems. 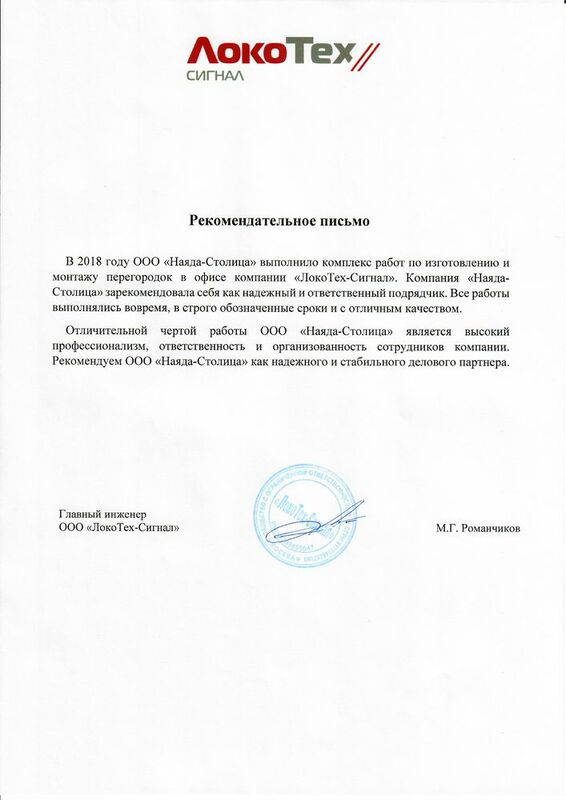 Цена: от 4 000 руб/кв.м. 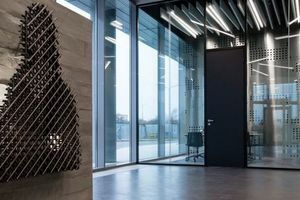 Prevent the spread of fire and smoke in the escape route zones, hallways and lobbies, thanks to their flame-retardant finishing (laminated glass up to 38 mm thick and powder coatings). 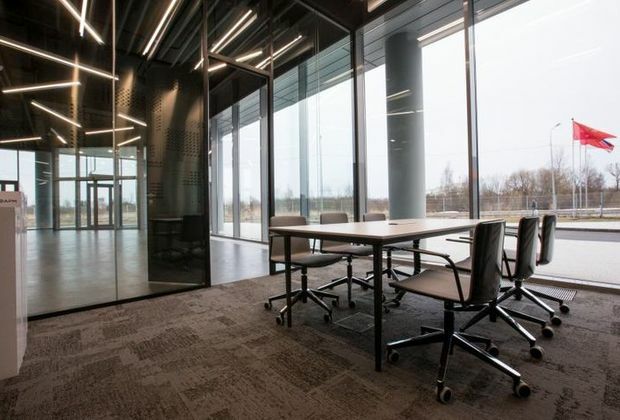 These partitions for offices are manufactured in accordance with the requirements of SNIP 21-01-97 “Fire safety of buildings and structures.” All products are have been tested and certified. Provide an opportunity to quickly and easily transform a single office space into conference halls, work zones, meeting rooms, restaurants. 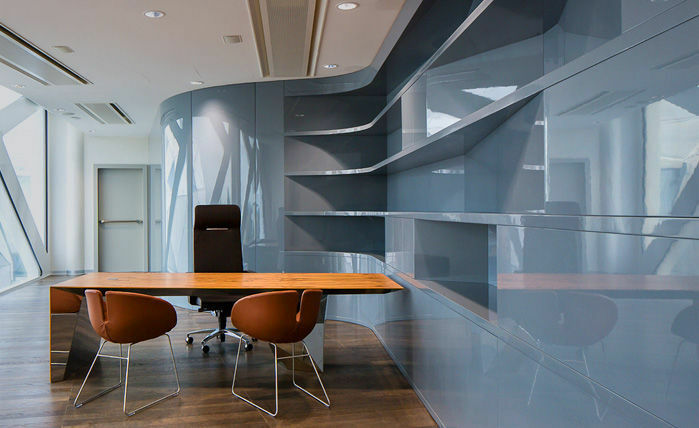 We offer office partitions made of solid glass, aluminum profiles, finished with decorative panels. Their mobility is combined with high sound-insulating properties – the ability to block sounds of up to 42 dB. 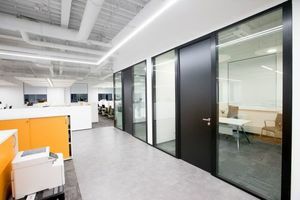 Modular partitions made of aluminum, glass and modern finishing materials (particleboard, fabric, and vinyl), up to 2.1 meters high, which are easy to disassemble and reassemble. In just a few minutes an open space area can be converted into a few comfortable rooms, equipped with furniture, work shelves and blinds. In the traditional sense, the office of the executive must have a noble "cold" color, be elegant, stylish and impress people. Counters for reception areas (reception counters) from the NAYADA Company are a convenient solution that not only blends with the other pieces of furniture, but also is simple and easy to install. 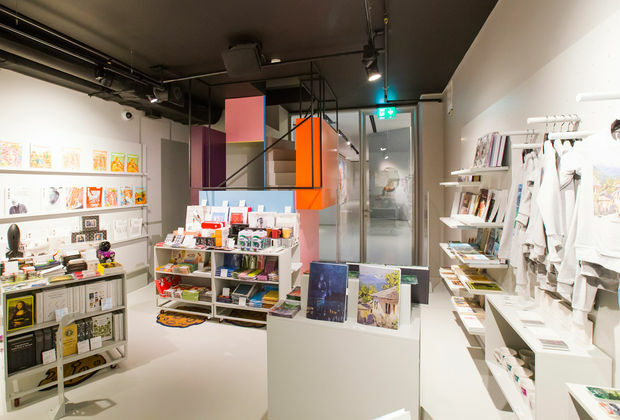 Door is one of the most important interior details, it serves functional and aesthetic cause. Door should be reliable and sound-proof, on the other hand, it should seamlessly blend into interior design. 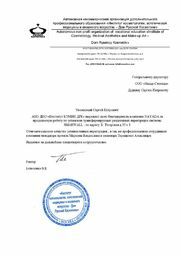 Our company was the first to received ISO 9001:2000 certification, among Russian manufacturers of office partitions. 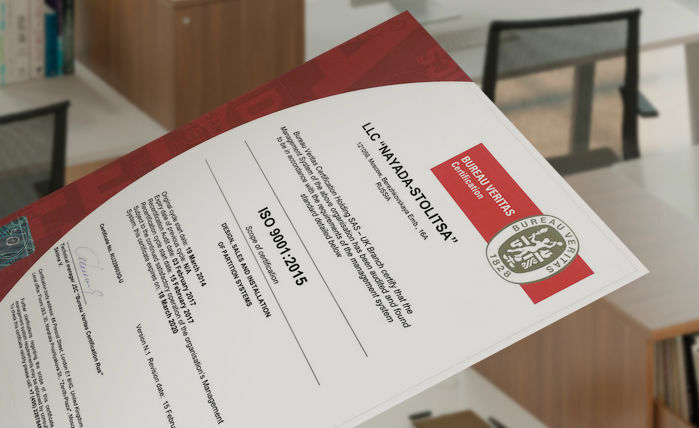 In 2011, NAYADA received another certificate – the ISO 9001:2008. NAYADA Offers modern solutions for demanding clients – and guaranteed these types of products for 3 years. 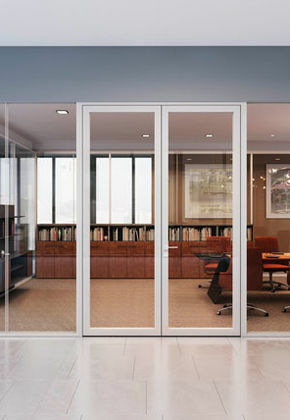 The company NAYADA is a leading developer and manufacturer of office partition systems. 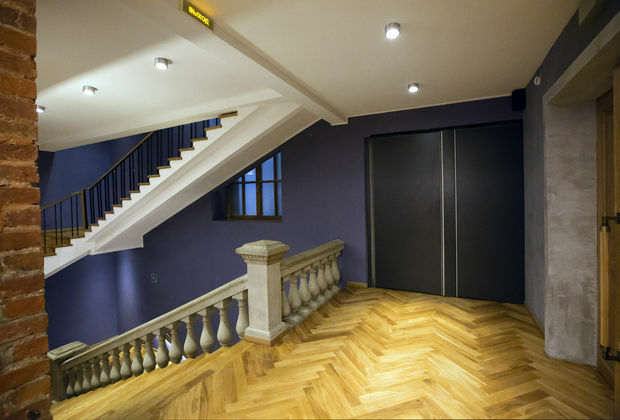 NAYADA offers a wide range of partitions, doors, reception stands and furniture. The product range includes both exclusive models, as well as ready-made solutions. The company has representative offices and dealerships in many regions of Russia and the CIS countries. 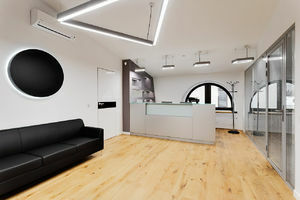 The company’s central office is located in Moscow. 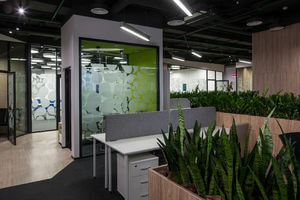 During 20 years of successful operations, the NAYADA Company has become the undisputed leader in the manufacturing and sale of partition systems for offices and various public interiors. During this time, our production base has reached an impressive size – over 20,000 square meters. 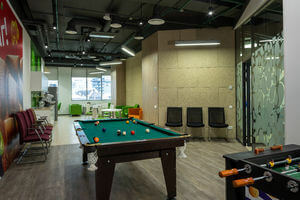 Just in Moscow, in one month, more than 200 projects are implemented using use our products. 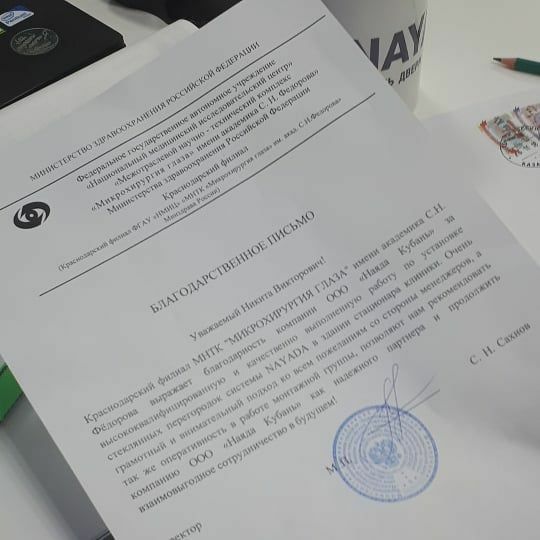 Moreover, a total of 4,000 projects are implemented annually in Russia and abroad, with 80% of our clients being repeat customers, or turning to us through recommendations. Clients are attracted by the undeniable advantages offered by our products – safety, quality, modern ideas and a variety of solutions. We strive to create the most functional, technically perfect, and at the same time aesthetic products. Our product range has grown significantly in recent years. The number of staff has also increased – today NAYADA employs more than 1,000 people. 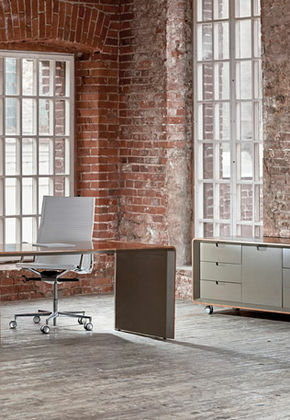 The reliability of our office partitions is ensured by the latest production lines and certified manufacturing systems. In order to ensure the highest quality products for our customers, we have equipped our production facilities with the latest modern machinery. This allows us to use complex innovations in our projects (one in four projects calls for this). In particular, the most recent project were supplied with NAYADA Hufcor functional office partitions, with maximum heights of 17 meters. 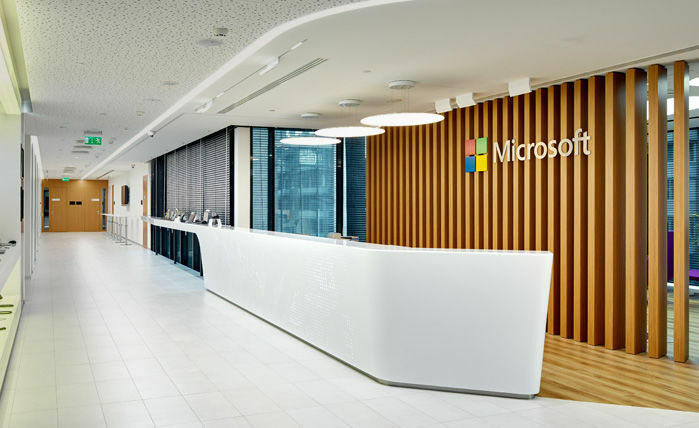 We offer our clients a comprehensive service, which includes the creation of a design project of office space, repair, finishing "turnkey", as well as delivery and installation of partitions, office furniture, reception counters. We are working in all regions of Russia and CIS, headquartered in Moscow. Our company attracts the most sought-after architects and designers. With us, you can implement any, even the most complex ideas. For their realization, we offer an advanced technological base. NAYADA supports designers and architects, creating all the conditions needed for their creative and professional development. Since 2005, we have been holding the international competition – ArchChallenge, where budding designers and architects have the opportunity to realize their ideas with the help of NAYADA Company’s production base. The company works with leading architectural and design bureaus, constantly introducing new developments and expanding its product range. 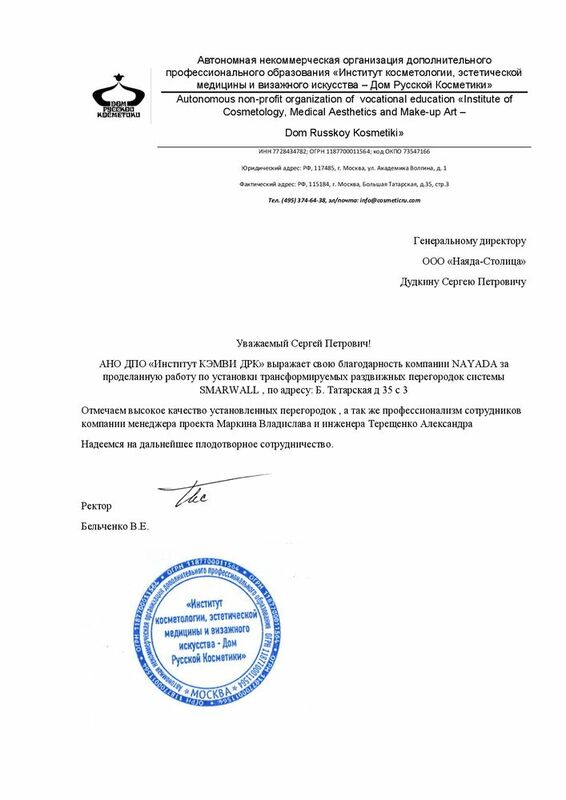 In cooperation with them, NAYADA successfully represents Russia on the international market. 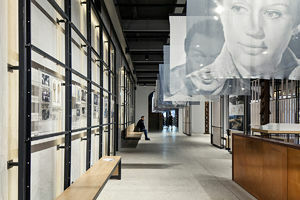 The “12 Architects Create Furniture” project enjoyed success with the professional community at the international exhibition of office furnishings – the ORGATEC-2012 in Germany (Cologne), as well as the main exhibition of the furniture industry – the I Saloni 2013 in Milan. 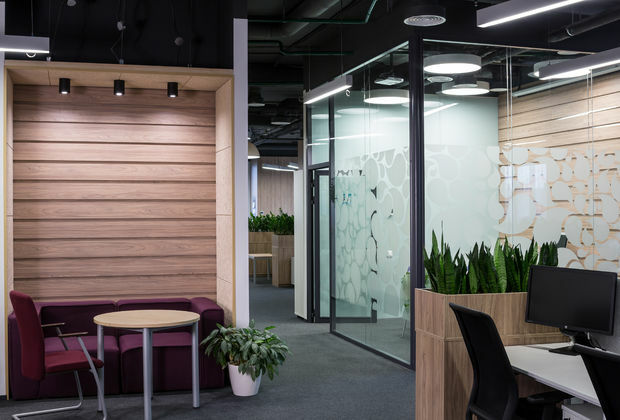 The premises of all three international airports of Moscow, the Bolshoi Theatre, the leading business centers and SEC’s were created using furniture, doors and office partitions made by NAYADA. 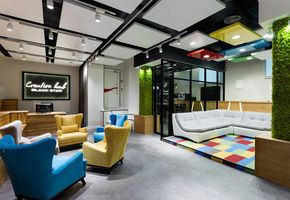 Products of our company adorn the offices of Russian Railways, the Central House of Artists, Yandex, Google’s Moscow Office, Nokia, Johnson & Johnson, Sberbank, Microsoft, Pernod Ricard Rouss, Central Children's Store, Gazprom, Aeroflot, Megafon, the Museum of Modern Art Garage, etc. 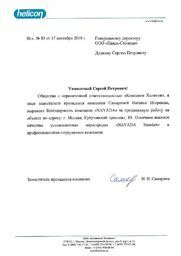 To learn more about other well-known companies, who have ordered NAYADA products, please visit the «Our Clients» section. Many of the creative development of our company have been honored by prestigious awards. Projects, in which NAYADA office partitions were used, have received the following awards – the Best Office Awards 2010-2013 and 2015, Red Dot Design Concept. 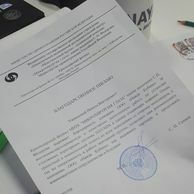 Созданный архитекторами DESIGN SOLUTIONS интерьер напоминает скорее выставку современного искусства, чем типичный завод. 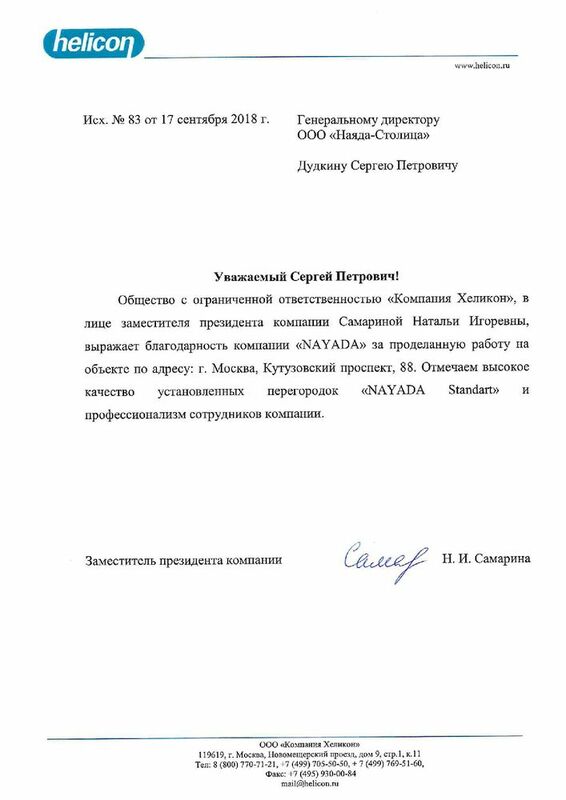 Обилие стекла от NAYADA, перфорированные металлические панели, панно из труб, бетон задают общую индустриальную дизайн-концепцию. 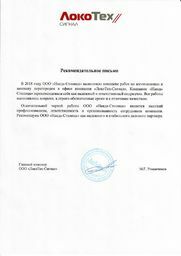 Заводское оборудование, лаборатории гармонично объединены здесь с офисным пространством. Products: Operative furniture LAVORO, NAYADA-Standart, Reception counters. 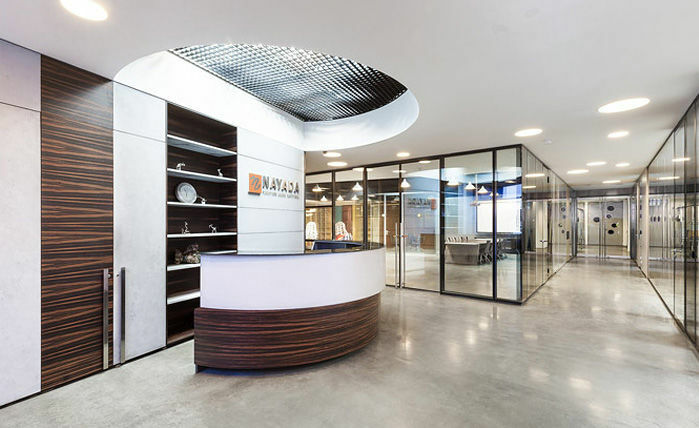 NAYADA, a Russian designer and manufacturer of interior partition systems, doors and furniture, launched its production site in the Kingdom of Saudi Arabia. Why do customers choose our products? Quality corresponding to world standards. Durability and a 3-year warranty. 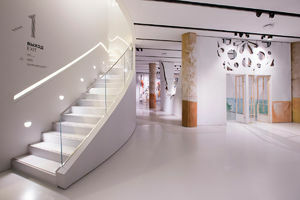 Aesthetics and a wide choice of solutions, using various combinations of materials, colors and patterns. Custom designs according to customer’s corporate style. Partitions and other products are sold throughout Russia and the CIS countries. Fast turnaround for projects of any complexity. 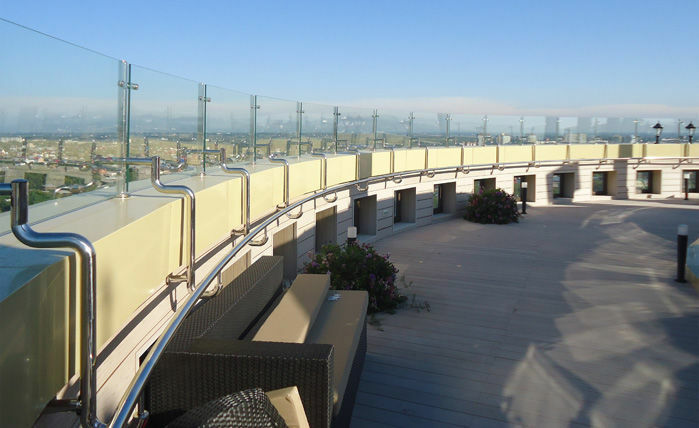 We offer a full range of services – from design to measurement and installation. All orders are filled fast and accurately. 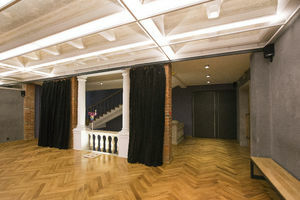 Installation of fire-resistant partitions is carried out under MOE license. How to buy NAYADA office partitions? 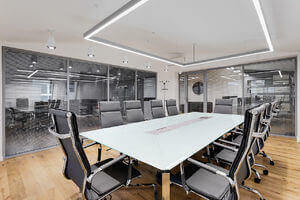 Our office partitions are sold throughout Russia and the CIS countries. Order a callback from our website, use the online consultation form to get more information about prices and services. If you wish to buy office partitions in Moscow, you can visit our production and logistics facilities or the NAYADA Office. NAYADA offers development of design projects for comfortable and correct distribution of workspaces, including through the use of partitions. NAYADA develops, manufactures and installs commercial partition systems for shopping centers. 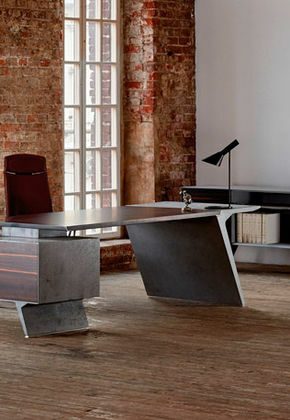 The main feature of this furniture is its exclusive designs, expressed as specific stylistic solutions. Projects requiring custom solutions. Wall and ceiling panels veneered. Reception stands made by NAYADA are practical and elegant. 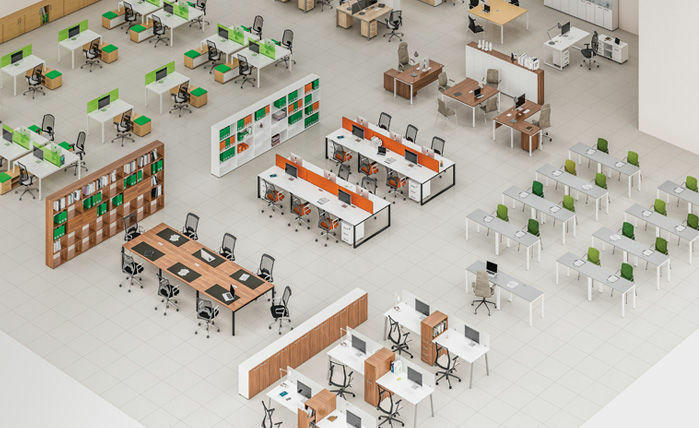 NAYADA carries out a full range of works on the arrangement of spaces in business centers.